US President Donald Trump will continue to suspend key sanctions on Iran, and so avoiding jeopardising the 2015 nuclear agreement, US officials say. But Mr Trump is expected to set a deadline for Congress and European allies to improve the deal or the US will abandon it, the officials say. He is also likely to impose a new set of sanctions targeting Iranian firms and individuals, a top aide has said. Mr Trump has strongly criticised the deal, which helped end a long crisis. European powers say that the accord is vital for international security. The agreement between six global powers and Iran saw decades of international and US nuclear-related sanctions suspended when Iran agreed to limit its nuclear programme. The US still maintains separate sanctions on Iran related to matters such as terrorism, human rights and ballistic missile development. The White House is due to make an official announcement on Friday. What does Mr Trump want to change in the Iran deal? The US president declared in October that the agreement was “one of the worst and most one-sided transactions the United States has ever entered into”, and warned that within a few years Iran would be able to “sprint towards a rapid nuclear weapons breakout”. He accused Iran of committing “multiple violations” and promised to work with Congress to “address the deal’s many serious flaws”. Mr Trump said they included the deal’s “sunset clauses”, one of which allows for the lifting of restrictions on Iran’s uranium enrichment programme after 2025. He also wants to give the International Atomic Energy Agency (IAEA) access to Iranian military sites, and for the deal to cover Iran’s ballistic missile programme. In its most recent quarterly review, the IAEA, the global nuclear body, said Iran was complying with treaty. Critics of the deal in the US Congress have also proposed amending legislation to ensure that sanctions would “snap back” automatically if Iran carried out certain actions. The sanctions, which were suspended in 2016, had cut Iran’s central bank out of the international financial system and imposed penalties for buying Iranian oil. Why does Europe back the nuclear deal? The foreign ministers of Britain, France, Germany and the European Union met their Iranian counterpart Mohammad Javad Zarif in Brussels on Thursday to reaffirm their commitment to the accord, which was also backed by China and Russia. At a news conference afterwards, representatives of the EU, the UK, France and Germany reiterated their support for the nuclear deal they helped negotiate. “The deal is working; it is delivering on its main goal, which means keeping the Iranian nuclear programme in check and under close surveillance,” EU foreign policy chief Federica Mogherini said. UK Foreign Secretary Boris Johnson insisted the deal was preventing Iran from acquiring nuclear weapons, and challenged Washington to come up with a better alternative. He described the deal, which is known formally as the Joint Comprehensive Plan of Action (JCPOA), as a “considerable diplomatic accomplishment”. Mr Zarif warned that Iran’s continued compliance depended on Washington honouring the deal. He said the Brussels meeting had shown a “strong consensus” that Iran was complying with the pact, had the right to enjoy its economic benefits and that any move that undermined it was “unacceptable”. 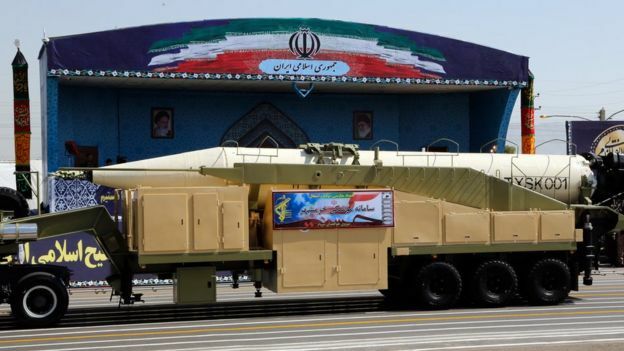 Why is Iran’s missile programme controversial? The US and EU say Iranian ballistic missile tests conducted in the past year have violated UN Security Council resolution 2231, which endorsed the nuclear deal. The resolution calls upon Iran not to “undertake any activity related to ballistic missiles designed to be capable of delivering nuclear weapons, including launches using such ballistic missile technology”. Iran says the missiles it has tested are not designed to carry nuclear warheads and insists its nuclear programme is entirely peaceful. The European ministers expressed serious concern about Iran’s ballistic missile programme, as well as its alleged transfer of missiles and assistance to non-state entities in the Middle East. But they said the issue should be kept separate from the nuclear deal.